Where you'll find items hand-made from the heart. Announcement Thank you for stopping by my On-Line store! Here you'll find handmade items such as crocheted scarves, hats, gloves, baby items and sewing items such as Rag Quilts, Zippered pouches.... just to name a few. You may also find handmade greeting cards or other Paper crafting items. A little bit of something for everybody of ALL ages. I use the best of materials in everything I create. As well as TLC in everything I make! Thank you for stopping by my On-Line store! Here you'll find handmade items such as crocheted scarves, hats, gloves, baby items and sewing items such as Rag Quilts, Zippered pouches.... just to name a few. You may also find handmade greeting cards or other Paper crafting items. A little bit of something for everybody of ALL ages. 16 Pocket Crayon Roll Holder, Crayons INCLUDED, Kids Gift, Crayola Crayons, Crayon Storage, Crayon Roll Up! Absolutely beautiful !! Made well and the color is so pretty !! My granddaughter loved the mermaid blanket. THANKYOU !!! New in my shop!! Order yours in time for the Holidays! 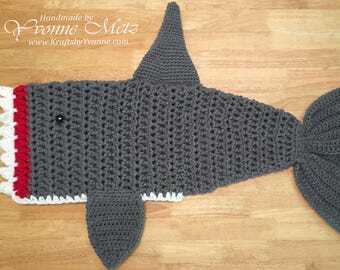 Perfect for any Shark Lover! New Sizes available! 18" Doll size and up! Plus ready to Ship listings!! If you've bought one from me for your Child now you can get a matching one for their 18" Doll! I strive to give my customers the best possible experience here on Etsy. So please take a moment to become familiar with my policies. If you have any questions, please do not hesitate to get in touch with me. My satisfaction is your satisfaction. I hope that you are satisfied with your purchases. If anything is wrong with your items, please contact me within seven days of receiving your order. Buyer will be responsible for return shipping except in cases of damages items. No Refunds/Exchanges on Custom Orders! But will be more then happy to work something out. Payment is via PayPal only. No checks or money orders accepted. Sales tax will be collected for buyers residing in California. Order will not be processed until paymentis received. Your order will ship as soon as possible after payment is received and cleared - usually by the next business day. I will ship by the cheapest method unless you request otherwise. Items will be carefully packed in a padded envelope or box, as appropriate. I usually don't ship on weekends, BUT if I can I will. I do my best to charge reasonable shipping rates. Estimating totals, especially for combined items, can be tricky. If I inadvertently overcharge you on shipping by more than $1, I will issue a refund through Paypal. Feel free to convo me for an exact shipping quote on combined orders. Right now I am shipping to the US only if you are interested in something here Please feel free to convo me. I may add Canada and a few other places at a later time. All my items created from a smoke-free home in California. Custom orders are always welcome! I am happy to work with you to create anything that can be made from paper, ink, stamps and yarn: cards, wedding/baby favors, custom announcements and invitations, baby blankets, hats, scarves, you name it! Anything you see in my shop can be customized as far as color, image, occasion, etc. Need more then just 1? I can do multiples (note that depending on the item, some variation may be expected due to the nature of the craft(s). In order to keep costs down I will not be including an invoice/packing list with your order. You can easily get it through your PayPal account for your records. If you need an invoice included in your package, please let me know in the "notes to seller" box when you check out. Convo me with any questions - I'll be more then happy to help you out with any needs you may have!